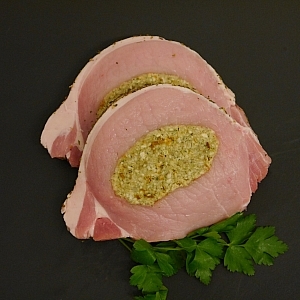 FREE RANGE PORK LOIN STEAKS STUFFED (2 X 200gr) from Camerons Quality Butchers. the same advantages of the pork steaks, (no bone and rind) with sage and onion stuffing through the centre and a herb crust on the outside. approx 2 steaks.